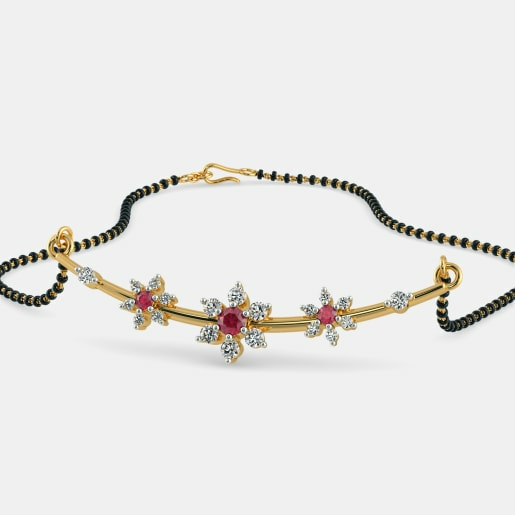 The word mangalsutra is derived from a combination of two words- mangal meaning auspicious and sutra which means a string, thread or binding material. Representing the union of two souls in marital bliss is this ever sacred and pure pendant denoting a strong bond. When you are thinking of buying something so close to your heart, why should you think twice? Order the piece of jewellery signifying bonding and binding and buy diamond and gemstone mangalsutra online. Here is an example. 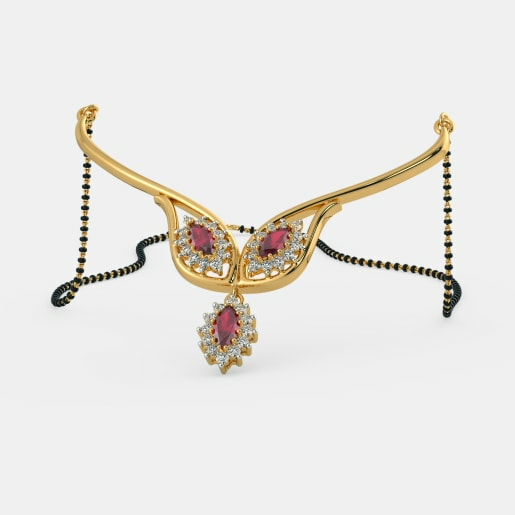 Try the Amulya Mangalsutra, which consists of a v-shaped gold line with a central sphere of ruby surrounded by diamonds. On either side of this pendant are two smaller spherical replicas, with alternating tiny diamond studs. The beauty of the mangalsutra lies in the fact that the gemstone and diamond pieces convey so much beyond ornamentation. When you think of a mangalsutra, you think of a lifelong collaboration, don’t you? Without defying the norms of tradition, we have preserved the simplicity and exclusiveness of the designs. Diamonds and other precious gem stones add beauty to the concept. Making a bold statement while serving the purpose of what they represent, are a range of diamond and gemstone mangalsutra designs at BlueStone. The Sanjeevani Mangalsutra is clearly for the woman who loves her diamonds. 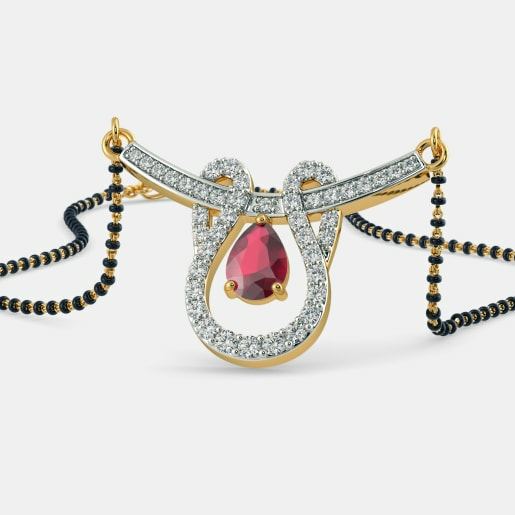 The mangalsutra comprises of a linear fashion of diamonds, dipping to a ruby and diamond double set pendant. The brilliance that the cluster of diamonds and red gemstone emit is unmatchable. 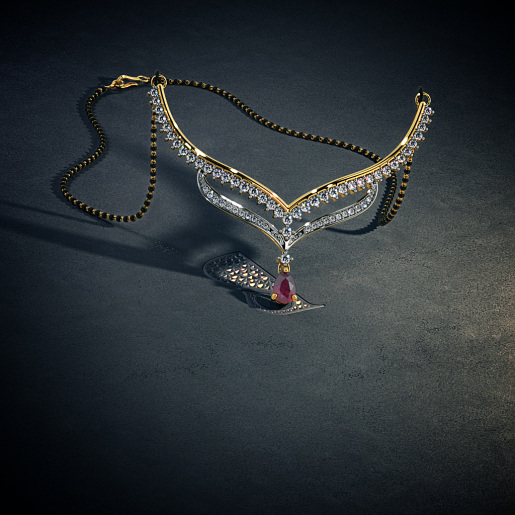 Combining floral and traditional diamond designs, with a ruby in the centre, is the Utpala Mangalsutra. There are many alternate patterns available at BlueStone. 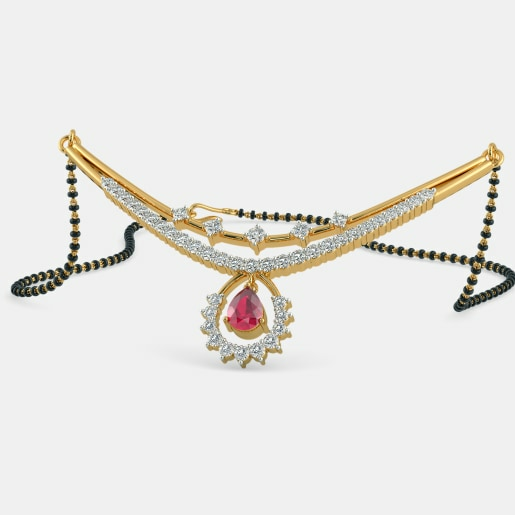 Check out the diamond and gemstone mangalsutra price and head on to click and buy the one that lies the closest to your heart. A mangalsutra is not just an ornament that is thrown around a woman’s neck to seal the wedding. It goes way beyond that. The mangalsutra signifies so much more than a mere wedding ceremony. It indicates an everlasting bond of love, friendship and togetherness. 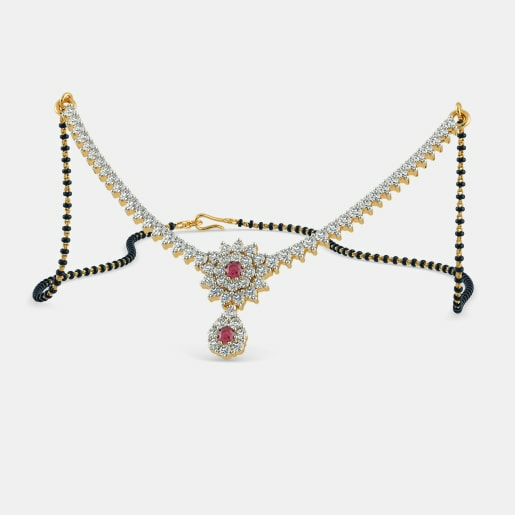 Take a look at the unique design of the Geetanjali Mangalsutra, having three rubies in an elliptical shape, surrounded by diamonds, two of which are encased in a gold cavity, with the main one converging into a pendant. Who says it is meant to be worn on the neck alone? With changing times and changing definitions of fashion, we strive at providing something new and unique constantly. 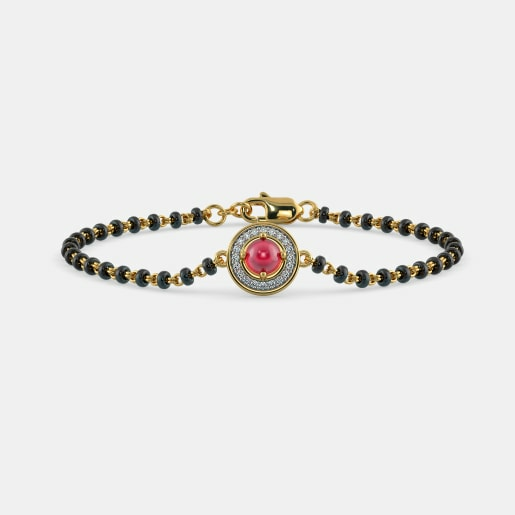 Without tempering with the theme in discussion, we have devised two mangalsutra bracelets as well. Check out the Harmya Bracelet and the Jagavi Bracelet. While the former incorporates a ruby and diamonds, the latter has a white pearl and diamonds in it. Scan through the range and buy diamond and gemstone mangalsutra designs. Representing the strong bond you share with your spouse, are a variety of diamond and gemstone mangalsutra designs. Of twists, turns and loops, are three differently shaped pieces containing diamonds, rubies and more than one linear arrangement at the focal point. Defying the regular shape and style are the Bharani Mangalsutra, the Parineeta Mangalsutra and the Dhana Mangalsutra. The common factors between these three are that they contain a pear shaped ruby stone each and a string of diamonds. Each of them has a definitive twist half way around the central area and they aim to add the right hint of colour and uniqueness to the pattern. Whether it is worn on your wrist or around your neck, the meaning of the mangalsutra remains the same and it holds values close to you. Choose the one with your favourite gemstones and check the diamond and gemstone mangalsutra price online. Compare them, talk to your family and decide what you want for your wedding ceremony, as the mangalsutra and you have a long way to go.